A rich and hearty meal ideal for a midweek dinner. Pick the rosemary leaves off the woody stalks and finely chop the leaves. Heat a large fry pan to medium-high heat, add half the olive oil and cook meatballs until brown and cooked through. Once cooked, place on to a clean plate. In a small saucepan, heat stock until boiling. Turn off heat and set aside. In another large saucepan, heat remaining oil and sauté onion and garlic until soft. Add in rice, and stir to coat. Add in stock one ladle at a time, stirring in between. Let the rice absorb the liquid before adding another ladle. When the rice is almost cooked, add tomato pasta sauce and stir. If necessary, add ½ cup hot water to loosen the risotto. Then add meatballs in for two minutes to heat through. Stir in half the parmesan cheese until melted. Serve risotto topped with remaining parmesan and basil leaves. Serve with a side salad. 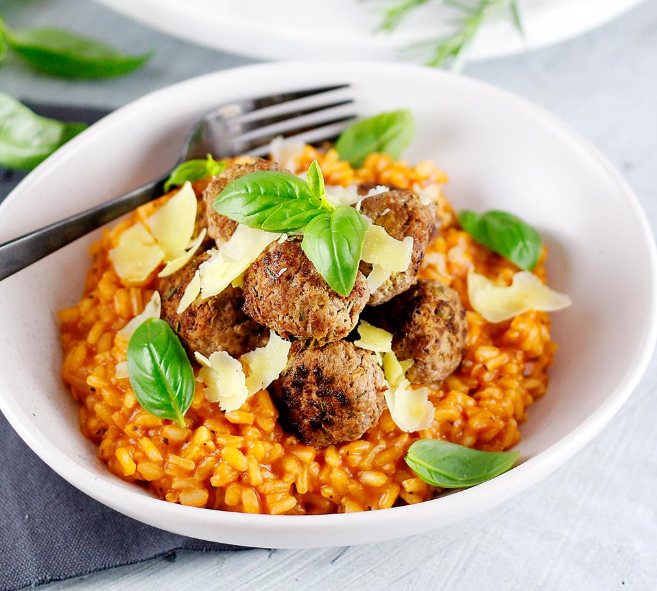 Tomato & meatball risotto is delicious.